It's strange that from my childhood time during every election, I felt sad. There was always somebody who would be elected and represent Gwalior in the Parliament as a back bencher. The beauty of Gwalior was always mercilessly trampled by such people who never knew the actual Gwalior. The parliamentary seat always went to obscure people who obviously have used their financial clout to get a seat allotted for them. M.J.Akbar, a former Member of Parliament and a well known literary figure has confessed in his blog about the vast amount of money which each contesting member spends to retain the constituency. Gwalior, a small town in Madhya Pradesh has been famous for its dacoits, forts, palaces, royal intrigues and obviously its burning summer. I lived and love whatever Gwalior is and what Gwalior stood for at one time. Talking of dacoits, I remember when dacoits killed in encounter where strapped on the charpai and paraded in jeeps on the streets of Gwalior. I also remember the dalit man from the municipality with the heavy leather bag on his back, sprinkling water on the streets in summer. And then came in the eighties, an IPS officer named Rajen Chaturvedi who had a penchant for poetry and was responsible for the surrender of Phoolan Devi. It was through him one day I went to meet Phoolan Devi. It was such a great feeling, sitting next to her while listening her life in words. She never saw happiness till the end, even as a Samajwadi Party Member of Parliament shot to death in front of her house in Delhi. She was brutal and brunt and expected results which no politician could have such qualities. I sometimes wonder, could we have voted for her from Gwalior. Mohar Singh, another surrendered dacoit is well known for his awesome mustache, black turban and a gun that he carries all the time. He visited me frequently and had tea with me, telling me about his life in the Chambal ravines, at my Orthopedic practice at Padao, Gwalior. I remember listening to Atal Bihari Vajpayee ji's long, effusive and sometimes irrelevant speeches in Maharaj Bada in 1978 ' 1979. Peppered with poetry he was a rabble rouser. The poor and the illiterate of Gwalior voted for him and would vote for anybody if told and directed by Atalji. Advocate Shejwalkar who always won on a BJP ticket had nothing to offer to Gwalior except that he built his own huge house like many other Member of Parliaments in India. Long queues of people standing outside his house, waiting for a favor was a regular spectacle early in the morning. I remember seeing him once on a Doordarshan black and white channel sitting on the backseats of the parliament, dozing off during the session. Rama Shankar Singh or Rammo Bhayya a member of the Legislative Assembly and a Minister of State was the youngest legislative member from, Bhind, Gwalior. A great friend, he knew the mind of Gwalior and exploited it to its maximum. He like many others never gave anything to Gwalior. There were always favor seekers and money changing hands at his home on the Racecourse road. Books on Marx adorned his bookshelves. He now runs private engineering institutes in Gwalior. Madhav Rao Scindia was one such charismatic character from Gwalior. I met him a number of times at Gwalior and Delhi and was always entranced by his great knowledge and charm. He had a grip over the pulse of the people of Gwalior. A nine-term member of the Lok Sabha, Madhavrao Scindia never lost an election since 1971, when he won for the first time from Gwalior at the age of 26. He contested as an independent with the support of the Jan Sangh, a party that his family had for long patronized. In 1977, he switched to the Congress Party despite resistance from his larger family, and won the Gwalior seat a second time. In order to avoid a direct contest with his mother, he later shifted to the neighboring constituency of Guna. But in 1984, he was nominated the Congress candidate in Gwalior as a last-minute maneuver to defeat the Bharatiya Janata Party's Atal Behari Vajpayee, and won by a massive margin. Since then Madhavraoji contested from either Gwalior or Guna and won on each occasion. Unfortunately in spite of representing Gwalior a number of times, Gwalior remains a dusty old town full of derelict architecture, tombs and mausoleums and an era which somehow lost its way while passing through. The only notable thing he did was sprucing up the Railway station and starting a few luxury trains to Gwalior. He couldn't attract many industries nor investments to Gwalior. He may not have done anything for Gwalior, but he was the face of Gwalior in the Parliament and internationally known for his spectacular speeches on any subject. Madhavraoji had a deep interest and commitment to literary activities. Thus instead of restricting his visits to political meetings, he was often the guest of honor in literary and cultural programs. On such occasions people used to request him to recite a poem after his formal lecture was over. He always used to oblige people by reciting choice poems or Urdu shayari. Madhavraoji died in an air-crash in 2001 leaving Gwaliorites with little hope for future. Another face which remains popular in Gwalior till today is that of my friend Brijendra Tiwari. Popularly known as Munna Tiwari, he remains a great guy to get along with. Many an evening, I have spent at his home or in village haveli discussing politics. He stood from Gwalior a number of times but lost unfortunately. He is a member of the Legislative Assembly having won finally from the Gwalior Girdh (Rural) constituency. As a lone voice in Bhopal, he has hardly any support towards the development of Gwalior. 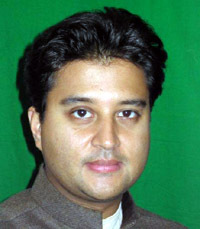 Jyotiraditya Scindia, the son of Shree Madhavrao Scindia remains a very simple person with easy accessibility in spite of being an important Member of Parliament from Guna. He has no airs, and an absolute pleasure to talk on any topic with him. He studied at The Doon School, India, and Harvard University and Stanford University, USA and went on to work as an investment banker for Merrill Lynch and Morgan Stanley. He also gained some development experience with the UN Economic Development Cell. He in fact had the distinction of being the only undergraduate intern in the UN Economic Development Cell. I have heard him speak in many debates on Finance and Development on NDtv and in the parliament. He remains a hope for the people of Gwalior. The youngest daughter of Rajmata Vijayraje Scindia, she lived all her life overseas. She returned to India in 1994 and went into formal politics, contesting the Madhya Pradesh State Assembly Elections in 1998 as a member of the Bhartiya Janata Party and then being re-elected 5 years later once again, for a second term in 2003 in the State Assembly elections. She is an active member of her State Legislative Party. Shrimant Yashodhara Raje Scindia was serving in Madhya Pradesh Government as a Cabinet Minister for Tourism, Sports & Youth Welfare. In October/November 2006 Yashodhara created a controversy of sorts when she got the BJP Government in Madhya Pradesh to issue a notice saying that she would be officially addressed as "Shrimant" which means your highness or your majesty. Yashodhara Raje may belong to the royal family of Gwalior but she neither knows where Pagnis ka Bada is nor Mandre ki Mata in Gwalior. Ashok Singh born and bred in Gwalior was a poor choice as a Congress candidate as he couldn't provide the confidence to the Gwalior masses that his candidature needed. Mrs. Maya Singh, another member of the royal family is the Member of Parliament from BJP in Rajya Sabha. Nominated by the BJP, she never talked on Gwalior or its development. Dr. Amarjeet Singh Bhalla an ENT Surgeon and the owner of Sahara Hospital, the only major hospital in Gwalior that caters to all and the needy is another face which Gwalior is proud of. I have seen him sending doctors and food packets every week to rural areas. Many a times he was approached by politicians to stand in the elections. He has resisted till now. He would have been the ideal representative which Gwalior has long needed. Gwalior remains a town with stunted development, roads with potholes everywhere, shopping malls that we only dreamt of, hoardings that stand out like sore thumbs and crumbling historical buildings vandalized and desecrated, streets leading to it tell a story of a once proud heritage.